I’m about a month into the “serious” planning stage for the first annual Portlandia Backgammon Classic. So far, I’ve locked down a venue and dates, drafted a flyer, gotten feedback, made changes, sought more feedback, etc. My initial planning was to figure that February or March was the window in which I could conceivably do it – April starts to get busy for me at work, and so it had to be before then or after May, once things slowed down again. I sent an email with that vague amount of detail to USBGF, and was advised to give them at least three months runway to help get the word out, which meant March was better than February. Well, the venue I had talked to back in June was booked up for both months, and so priority one was to find a new place. I sent out about 8 queries to hotels, restaurants, and other event spaces. Pricing and availability was all over the place. The airport Sheraton was the most flexible (assuming I would take one of the two weekends they had a last minute cancellation for, which I would), and by far the most affordable! So, I got the venue and dates locked down the Tuesday before leaving for Las Vegas for a work conference and the Las Vegas Open. That did not leave enough time to get the flyer finalized before, but at the suggestion of Bill Riles (of the San Antonio tournament), I made a very vague half-page flyer that at least got the word out. Of course, I also did not have time to update the Portlandia page of this website before then, so it was a vague half-pager leading to a vaguer landing page – but it was a start. At the Vegas tournament, I had the opportunity to talk to a number of other tournament organizers: Bill, Carol, Patrick, and of course Howard. I got a lot of good ideas just from watching how Vegas was run, and benefited greatly from the many conversations. I was not far off in my thinking about how long I needed for the main tourney, but greatly modified my plans for the (limited) side events. And I walked away with a new stack of flyers to consider for inspiration. Also, USBGF brokered some help for me in the form of a “mentor” – Kristina, who had run the Seattle tournament while that was an ongoing event, agreed to serve as a sounding board and possibly even help run the event! Today, I think I have finalized the flyer, and have sent it out to my semi-voluntary feedback committee. The main thing I was working on was setting the entry fees and rake. I used Chicago Point to get a better sense of the number of attendees to expect at each entry level, and looked up the flyers from a dozen or so tournaments to get a good idea of the expected entry fees. What I learned was that the open/championship bracket should have higher stakes than I was thinking, to make it more worth the while for people who want that level of play. There’s a wide variety of hospitality fees and rakes being applied at different tournaments, and I think I settled on one that makes sense. The hospitality fee will probably be excessive for the amount of food and beverage we’ll actually order, and the rake will probably be excessive for the amount we’ll actually spend on trophies, give-aways, supplies, etc. But that’s deliberate – the club has been running at a deficit since I took it over, and I want a grub-stake for making next year’s tournament bigger and better. If it goes especially well, I’ll drop the rake on the monthly meetup tournaments, and still be positioned to grow the “big” tournament for next year. For one thing, I do not assume I will get the screaming deal on the venue that I got this year ever again… I’m not asking for anything “out of market” with other tournaments, and so I think it will be well received. If all goes well, the flyer will be finalized by end of the week, and I will start the advertisement push. Come January, it’ll be time to start arranging the physical items for the event (ordering trophies, etc. ), and start filling in details. I’m very excited to be putting the event on – and I hope it will be a break-through type event for the local players. There’s certainly a decent amount of excitement from the people I talked to in Vegas, and so I’m pretty optimistic at the moment. I can’t wait to share the flyer with you all, and to see how this all shakes out. I attended the Las Vegas Backgammon Open this past weekend, my first time going for that big of a tournament, and played in the intermediate bracket. Bryan was also there, playing in the same; and Mark F was playing in the open. So, pretty good representation from the Portland Backgammon crew. Mark F ended up winning the consolation flight of the open, making him the most successful of us (as usual)! 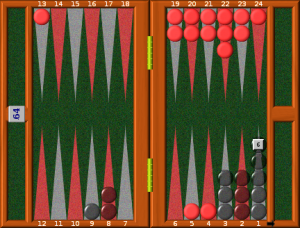 I had a couple of highlights – Wednesday night I got to play a 5-point blitz again Paul Magriel, and got lucky! I mean, it was lucky to get to play him in the first place, but I got lucky in the match! First game, I offered an early cube – not an error I don’t think, but an easy take only a few rolls in. But then I immediately rolled a double that covered two more points on my home board and it went well for me from there. That’s one beautiful thing about this game – even a rookie like me has a chance against one of the best in the world, at least in a short match! In the main event, I made it to the semi-finals, then crashed and burned from there. The game that took me out was against James, who went on to take second overall in the intermediate. The loss was spectacular – I had doubled him early, he was turning it around and recubed me, and in my biggest blunder of the tournament (in effect, I might have done even stupider things that worked out ok), I took. Well, that game ended with me having 3 on the bar as he was bearing off, and I danced and danced and danced. Got backgammoned holding a 4-cube in an 11 point match. You can’t do that too often and win. Fortunately, as we both were nervous about a game that made the difference between cashing and crashing, we had agreed to a hedge, and so he paid me out a decent amount for losing! At this point, I have 7s or 8s to hit on the outside, 4s to hit on the inside, but pretty good chance that he re-enters and I have a blot somewhere. I did not double, and GnuBG backs me up – I’m only 55% to win and double/take is a -0.11 error. Two rolls later, the board looks a little different, and a little similar! 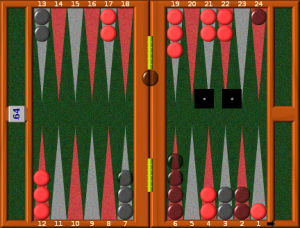 I rolled a 6-2, he came back with a 5-3, and I had to think some more. The dynamics look similar, and I again choose to just roll, but this time it was a mistake! I’m up to 72% to win, with 10% gammons – a perfect double and barely a pass for him. Luckily, I rolled a double 4, so did ok without the cube. Note the direction change, I’m just putting them up the way the camera captured them. Obviously, sitting relatively pretty here, but with some work still to do to get my back checkers out from behind his 4-prime. In his shoes, I wouldn’t think too hard about taking. But that doesn’t mean I shouldn’t double! I’m only 60% to win, but have 27% gammons. No double is a -0.172 equity error, one that I (shamefully) made. Finally, here’s a position from my first (and only) match in the consolation round, against Bern. Checker question this time – I rolled a pretty excellent double 1 – but what’s the best way to use it? Well, the first 1 has to be coming off the bar. Coming off to the 24 point seems wasteful, I would rather have two numbers that escape than have just sixes. So bar-23 takes two moves. 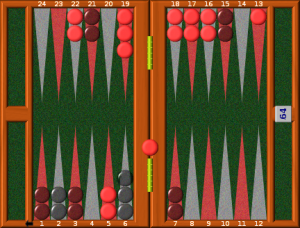 Then I had to pick between 6-5(2) and 2-1*(2). It seemed likely that one was right and one was wrong, and that’s true. When in doubt, hit? No! The right move was 6-5(2), and 2-1*(2) is a -0.355 blunder! A four-point board is much much better than a three-point board. Which way did I play it? I have no idea. Bern might remember, but I don’t. All that I remember was him hitting double-2 to bear off his last three checkers against my single checker on the 1-point in the bear-off, to push me into the Last Chance flight. Bern and I went on to play quite a few money games and some chouettes with Bryan, which was great – we were pretty evenly matched, which always makes for fun play. The other great thing about the tournament was, I got to interact with a number of other tournament directors, and got some great input as I prepare for the FIRST ANNUAL PORTLANDIA BACKGAMMON CLASSIC, to be held March 24-25, 2018. I need about another week to finalize the flyer and start getting the word out, but we had some half-page announcements to put out, and they got snatched up quickly. There’s a good amount of interest from people in Seattle, Vancouver BC, Denver, Las Vegas, LA,…. This could go much bigger than I’ve been anticipating! Or, it could be pretty small. We’ll see – either way I am excited to bring a bigger backgammon opportunity to the Portland Metro area. Stay tuned, more details coming! My first match was against Tim. My recollection is that he won the first, I won the second, he won the third, then it starts getting blurry. I believe he got me down 4-1, but post Crawford I managed to gammon him with the cube turned to win the match. There was a position or two of interest, but I didn’t think to take pictures at any point, sorry. From there, I went on to play Sharon, then Rochelle, then Lee. Now not to give spoilers, but that was a tough road to the finals! I think in every match I ended up coming from behind to win post-Crawford. Now Lee had the advantage of having watched me play Rochelle, plus he was well rested after defeating Nathan and Bryan – no play-in match for him. I took an early cube in game 1, then lost by a gammon, putting us to Crawford in game 2. Well, no problem, I’d been coming back post-Crawford all afternoon. Lee was having none of it, he slammed me and won the final in 2 games! Rochelle squeaked past Bryan in the consolation flight, and so the dynamic duo took 1st & 3rd on their first tournament. I told them we like to have a newcomer win the first time so they get hooked and come back – well done all.